Quality designed and precision engineered to run smoothly, with the C205 from Chamberlain, you get reliability, easy installation, dependable operation, and a remote control, all at an affordable price.Powered by Chamberlain's MED Lift Power System, the C205 delivers lifting force equivalent to 1/2 HP, the highest lifting capacity compared to the 1/2 power class for effortless lifting and reliable performance you can count on. 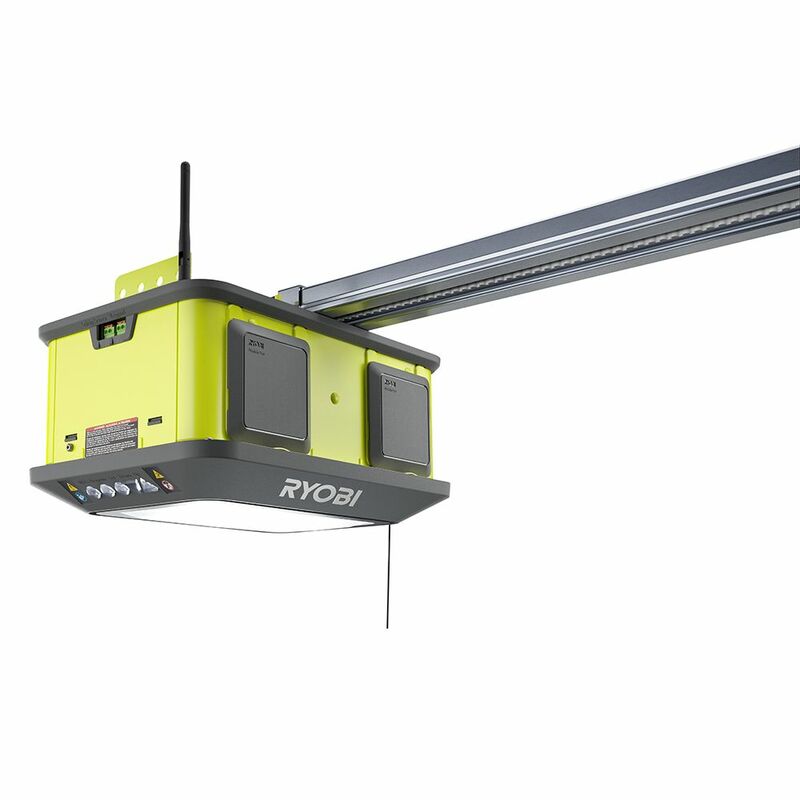 1-1/4 HP Belt Drive Garage Door Opener The Ryobi 1-1/4 HPs Quiet Garage Door Opener boasts a 1-1/4 HPs motor. An integrated long lasting LED light keeps your garage illuminated and ensures you don't spend time changing out light bulbs. Download the Ryobi Garage Door Opener App to monitor and control your garage remotely from your smartphone. Add any one of the Ryobi Garage Door Opener Accessories to customize your garage with the ability to do everything from playing your favorite tunes to having lasers ensure you park perfectly every time. 1-1/4 HP Belt Drive Garage Door Opener is rated 3.2 out of 5 by 205. Rated 4 out of 5 by Hoote from The only issue I have is that ONLY the car... The only issue I have is that ONLY the car remotes will “crack” the door, for pets to have access to the outside. The house base will not do it as well as the app controls will not do it. Rated 4 out of 5 by Jd from Great garage door. The only downfall is the app, as... Great garage door. The only downfall is the app, as it was hard to set up and there aren’t any very good troubleshooting guides for it. I had to call technical support in order to get it to work. Once I got it set up though, it works great. Rated 4 out of 5 by Tr3kker from I am a long time user of Ryobi GDO products. This was my second GDO install (first was the 2HP mo... I am a long time user of Ryobi GDO products. This was my second GDO install (first was the 2HP model). I will say that these installs are not for the novice user and require some advance SmartHome skills (if you can barely operate a smartphone, this is not for you). I would recommend unboxing, laying out all the parts, make sure you understand the parts and steps, watch the online videos, and READ THE INSTRUCTIONS (to include any addendums). What wasn't clear during my install was the indoor keypad does not use the 2 wires from your old GDO; it truly is wireless (except for the wires to the obstruction sensors). There was also a door position sensing unit that must be installed on the upper right corner of the inside of the garage door. It links with a separate unit, which then links with the indoor keypad. I didn't have any of these parts during my 2HP install, which confused me somewhat. I just feel the purpose of these devices could have been explained better. Once it was installed, the function was quiet and smooth. Sometimes with all the bells and whistles we forget that the main job of a GDO is to lift and lower a garage door. This unit funtions perfectly for that task. You're going to read a LOT of negative reviews here about the Ryobi GDO. Take them with a grain of salt. I was one of those reviews 3 years ago after my first install. I get it, you're mad and frustrated because you wasted the better half of a Saturday trying to make this thing work so you come on here and rant. After posting my negative review, Ryobi reached out to me and offered assistance. I was able to quickly fix my issue and I revised my original review. You're going to love this thing and all the bells & whistles once you get it installed. Take your time, don't get in a hurry, and READ THE INSTRUCTIONS. Rated 2 out of 5 by unhappycamper from Be forewarned, the instruction are cluttered with unnecessary warnings that... Be forewarned, the instruction are cluttered with unnecessary warnings that obstruct finding relevant information. With that said, shortly after installing, it stopped working with the remotes. After months of frustrating troubleshooting, it boiled down to a lock button on the inside keypad. Rated 2 out of 5 by MikeD from Great in concept, meh... in execution. RYOBI has a fantastic idea with this GDO. A hub, in the middle of your "workspace" that can house and power the tools you need? Yes, please! HOWEVER... The execution of this innovation leaves much to be desired. I've had this unit installed for about three months. CONS: 1. To start, the door sensors that came with my unit were faulty. RYOBI *was* good about sending a replacement set quickly, but the fact that they had to in the first place was annoying in the extreme. 2. The package that I purchased did not come with the Outdoor Keypad. That was an unexpected and unwanted expense. My fault for not checking the box, though. 3. The Indoor Keypad that IS included is wireless and AA battery operated. Normally, this would not bother me too much, but the thing has a bad habit of working only on occasion. It regularly drops sync with the main unit. Worse, there's no option to wire it directly to the main unit, like a traditional keypad. 4. The WiFi in my garage isn't the best, so the Remote Hub that lets the unit know if the door is up or down does not work. Mind you, the signal is strong enough for the main unit, just not the Hub. A WiFi extender/booster will be another added expense. 5. Much like the Indoor Keypad, the app for smartphone operation is spotty, at best. 6. Door open/close speed is pretty slow. Noticeably slower than my old unit. No option to adjust the speed, either. 7. The LED light could be brighter. (I know, that's a petty complaint, but there it is.) 8. I've not had a chance to try the attachments (sold separately) but I have a sneaking suspicion that their operation will be spotty too because they're run off of the wireless Indoor Keypad (see #3 above). PROS: 1. The unit is quiet. I suspect they added the annoying beeping sounds to warn users when the door is in motion, it's that quiet. The door itself makes a louder racket. 2. Door operation is smooth with no jerkiness or "bouncing". Just simple up and down, as it should be. 3. The car remotes work flawlessly, as does the Outdoor Keypad. All in all, until they work out the "bugs" I can't recommend this GDO. Personally, I'm very disappointed with this purchase. I don't have the money that would allow me to "eat" the $200+ that I have invested in this thing, so I'm stuck with it, for now. I can't speak to the newer models, though. Maybe RYOBI has worked all these kinks out. My advice: read user reviews CAREFULLY!! Rated 5 out of 5 by Mac from Works great. Not to bad to install.... Works great. Not to bad to install. Rated 1 out of 5 by RYOBIToolFan from Assembly instructions are poor. (Example One rail shows an arrow but doesn't tell you if it face... Assembly instructions are poor. (Example One rail shows an arrow but doesn't tell you if it faces the door or the head unit, it instructs you to connect wires to the Wireless Keypad???) programming the hand held remotes and wireless remote not to bad. However, after at least two-1/2 hours on phone with RYOBI and HOMELINK I could never pair the opener to my 2006 Volvo. Lastly Connecting the unit to your wifi has limitations (That are not documented anywher online or in-print) Your WIFI password has to be limited to 10 charachter, all upper case or all lower case - no mixing and cannot have special charachters.